A highly-contentious field of 10 filly and mare turf specialists are set for Thursday’s 45th renewal of the $100,000 Cardinal Handicap (Grade III) – a 1 1/8-mile test over the grass at Churchill Downs. The co-feature on the 12-race Thanksgiving Day card, along with the $200,000 Falls City Handicap (GIII), is slated as Race 9 with a post time of 3:24 p.m. (all times Eastern). The first post gets underway at a special time of 11:30 a.m. The Cardinal Handicap field is topped by 118-pound starting high weights Bonnie Arch, the Ellis Park Turf winner, and One Dreamer Stakes runner-up I Remember Mama. Bonnie Arch (20-4-3—$173,299), owned by Clarendon Stable, scored a half-length win in the Ellis Park Turf for trainer Ian Wilkes on July 8. 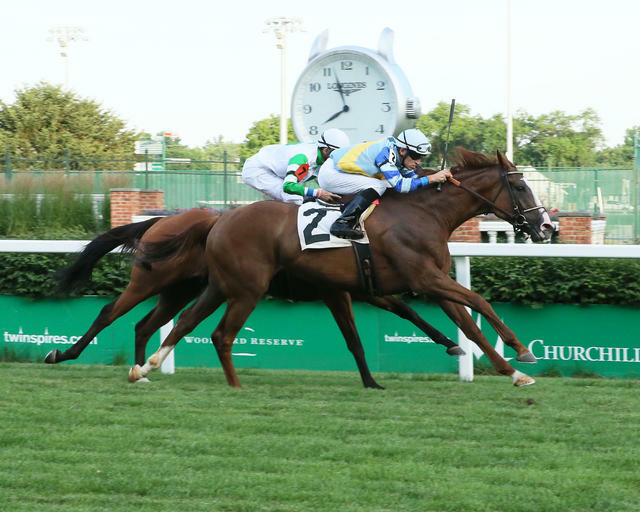 The 5-year-old Regal Ransom mare more recently finished third in the Kentucky Downs Ladies Turf Preview at Ellis prior to a lackluster eighth-place finish in the Kentucky Downs Ladies Turf, which was won by Insta Erma. The homebred will be ridden by Wilkes’ son-in-law Chris Landeros from the far outside post position No. 10. On the opposite end of the starting gate is Lewis Schaffel’s I Remember Mama (7-3-3-1—$172,800), who recently scored a one-length win over “soft” turf at Keeneland in an Oct. 27 allowance race. The 4-year-old filly by Ghostzapper finished a half-length behind Bonnie Arch in the Ellis Park Turf Preview before her second-place finish in the One Dreamer at Kentucky Downs. Trained by Tommy Drury Jr., I Remember Mama will be ridden by Brian Hernandez Jr. The complete field for the Cardinal Handicap (with jockey, trainer and assigned weights): I Remember Mama (Hernandez, Drury, 118 pounds); Amboseli (Florent Geroux, James Cassidy, 117); Space Cadet (Rafael Mojica Jr., Sam Logsdon, 113); Coachwhip (Ricardo Santana Jr., Jack Sisterson, 116); English Affair (Corey Lanerie, Rusty Arnold II, 117); Lipstick City (Tyler Gaffalione, David Fawkes, 116); Unbridled Escape (Jose Betancourt, Kelly Lynn Deiter, 114); Coco Channel (Edgar Morales, Charlie LoPresti, 114); La Manta Gris (Declan Cannon, Arnold, 116); Bonnie Arch (Landeros, Wilkes, 118).